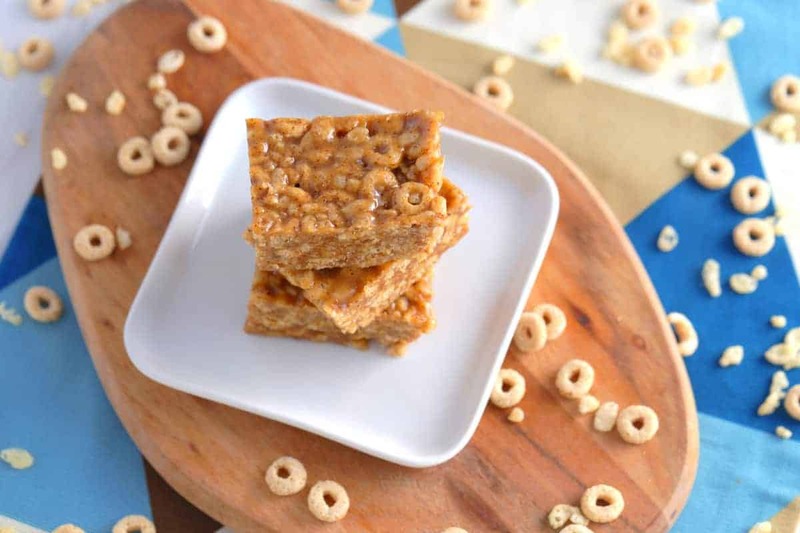 No Bake Cereal Bars with Cheerios & Rice Krispies—and NO Marshmallows! Satisfy your sweet tooth with gluten free, 4-ingredient, NO BAKE cereal bars! I opted for Cheerios and Rice Krispies to keep these treats whole grain and low in sugar. But, you could also use whichever cereals you like! Personally, I think adding plain Cheerios to the mix to makes these treats more filling Ann’s more satisfyingly crunchy. And, I switched things up from most traditional cereal bars recipes by using sticky brown rice syrup and almond butter to make these no bake cereal bars without marshmallows. Plus, the simple swap makes these goodies a bit cleaner and totally vegan! If desired, you could use honey or maple syrup as your sticky sweetener instead. But, brown rice syrup is stickiest, so I find that it works best to hold these no bake cereal bars together. Perfectly sweet-and-savory, deliciously crispy, and a great on-the-go snack! So, if you want to enjoy cereal that offers some ACTUAL nutrition, you have to read nutrition labels. Ideally, we want to choose more wholesome options with fewer added sugars and more (or ALL) whole grains. Since the first ingredient in Cheerios is oats and in Rice Krispies it’s rice, they’re 2 options that can keep your no bake cereal bars whole grain and more fuel-filled! And, both of these cereals are far lower in sugar than most, with just 1g in 1 cup of plain Cheerios and 4g in 1¼ cups Rice Krispies. Yes, whether it’s for breakfast or for these no bake cereal bars, plain Cheerios and Rice Krispies ARE better, more wholesome options. But, keep in mind, they’re still not better choices than real, whole foods that don’t come packaged in a box. And, despite their low sugar content, ‘sugar’ is still the 2nd or 3rd ingredient on these cereals. Plus, even though brown rice syrup is a less refined sweetener alternative to table sugar, it’s still sugar. The point here: these no bake cereal bars are cleaner and more fuel-filled, but they’re still a sweet treat. So, enjoy them like you would a treat—in moderation! As always, I’m a big believer that real, whole foods with nutrients that our bodies appreciate should make up the bulk of our diets. More veggies and fruits, fewer packaged, processed foods. But, when we are going to indulge, I’m also a believer in making cleaner homemade treats for ourselves. That way, WE control the ingredients. And that’s why these no bake cereal bars definitely contain more wholesome fuel and far less sugar than the traditional marshmallow-y treats! To a large mixing bowl, add cereal and mix to combine. In a saucepan over medium heat, melt almond butter and brown rice syrup until integrated. Pour cereal into pan and mix well to coat completely. Transfer to a baking dish (I used 6×8-inch) lined with foil or parchment. Refrigerate 45 minutes-1 hour to firm. Slice into bars, serve, and enjoy! Yields 10 no bake cereal bars. *Number of no bake cereal bars yielded will depend on size of your cut. Homemade Granola Bars, Vegan & Gluten Free!